Do you have tips on how to set up my monitor arms at the right height and depth? Yes, just read our handy PDF on how to set up your screens ergonomically. With a few adjustments you'll be working better, and in more comfort, with your laptop on your level. How do I secure my laptop to the mount? Your laptop will simply rest on the large platform of the Adapt Mobile. This makes it easy to remove your laptop when you want to work on the go. Your laptop needs to weigh less than 15.4 pounds and be smaller than 19" wide by 12" deep. This converter is designed to be used with laptop computers as opposed to a computer monitor. For a computer monitor you would be better off going with the View Monitor Arm. Is this only for laptops? We recommend just using a laptop for the Adapt Mobile, although it would be suitable for a larger tablet as well. There are two USB cords that will come out of the base of the UPLIFT Desk Mobile Converter. If you want to use the USB ports to charge your devices, then plug each cord into an outlet using a USB converter or plug them directly into your laptop. If you plug them into your laptop, you will also be able to transfer data! Is there any cable management on the Adapt Mobile? The Adapt Mobile arm has built-in cable organization. Just route your USB cord or laptop power cable under the cable covers on each of the arm segments. This way your cords will stay out of the way of the Adapt Mobile and your desktop will be neat! 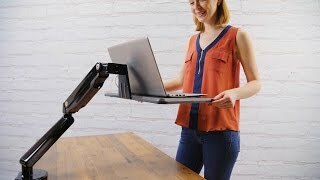 Will the Adapt Mobile Standing Converter be stable when I type on my laptop? Yes, the Adapt Mobile will provide a stable surface for you to type on. We just don't recommend leaning on the Adapt Mobile Desktop. Does the Adapt Mobile lock in place? The Adapt Mobile does not lock in place. However, it will remain in place when it is properly counterbalanced to the weight of your laptop. Is there any way to secure my laptop to the Adapt Mobile converter? The large platform provides a stable enough base for your laptop without the need to strap it into place. The platform will remain level as you move it so you won't have to worry about your computer sliding off. How big is the laptop platform? The laptop platform is 19" wide by 12" deep. Does the laptop platform tilt? No, the laptop platform will remain level as you move the arm of the mobile desktop converter. The Adapt Mobile doesn't stay in place, help! If you find that your laptop is sinking, then you need to adjust the counterbalance tension towards the heavier setting by turning the tension screw towards the plus sign. If you find that your laptop keeps rising then adjust the tension screw towards the minus sign. Add a little movement to your workday by outfitting your desk with the Adapt Mobile Laptop Standing Converter by UPLIFT Desk. Choose between all black, all white, or gray with black accents.